Spiral wound steel center tube wrapped with polypropylene migration barrier for strength and bypass protection. 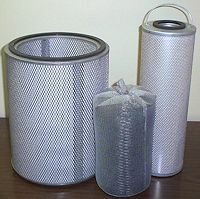 Perforated steel jacket for change out durability and element strength. Buna-N gaskets for positive seal and chemical resistance. Sturdy hoist handles for ease of installation and removal.